Carrier bags and refuse sacks full of cannabis have been fished from a river in Cambridgeshire. A "high quantity" of the soggy drug was found by officers and river bailiffs in the Nene, near Whittlesey, on Wednesday. Cambridgeshire Police quipped: "For anyone who would like to take up the newfound hobby of drug fishing, don't waste your time, we have got it all." Investigations to find out who dumped the bags are ongoing. 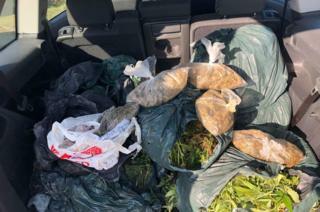 Officers recovered about 30 bags, most of which contained soil, however seven contained cannabis plants and cuttings and one was full of cannabis buds ready to be sold. The estimated street value has not yet been confirmed. "We will be knocking on [your] door in the near future. If these are yours and you would like to speak to us sooner then please feel free to contact us," the force added.